A bottle of bubbly was waiting in the fridge for Brixworth trainer Caroline Bailey after Global Dream removed her from the cold list at Leicester on Tuesday afternoon. The short head success from the Alex Hales-trained Running Wolf ended a frustrating time for Bailey’s Holdenby North Lodge stables after a sequence when her horses were being placed without quite winning. Now the Northamptonshire team hope their good fortune can continue with either Early Retirement, Crosspark or Qodiaq which are all entered to run at Huntingdon on Friday. Global Dream is owned by Sudborough-based Graeme and Susan Carsberg who have been keen supporters of the Baileys since the trainer first took out a licence under Rules in 2007. Indeed, they gave the local yard its first winner with Glen Thyne at Towcester. Trainer’s husband Gerald Bailey said: “This was Graeme and Susan’s first winner of the season and I am delighted for them as well as the jockey Adam Pogson who always rides this horse. Bailey added: “Caroline drew the short straw as she had to go to Wetherby (where Edward Elgar pulled up) and most of all I am pleased for her. TRAINER Andy Martin is hopeful of expanding his operation at Swerford near Chipping Norton when he gets a full licence in the spring. The permit holder, who currently trains half a dozen horses to go under Rules and one point to pointer, is eagerly awaiting the chance to make a greater impact, although the exploits of the 12-year-old Sunny Ledgend have gone some way to putting him in the shop window with five victories to his name, including two at Towcester and he was due to run at Ludlow on Wednesday. Martin speaks especially glowingly of the seven-year-old Militarian which won a maiden point to point at Dingley last March and which has shown up promisingly in two maiden hurdles this winter, finishing seventh of 13 behind the Nicky Henderson-trained Jenkins at Newbury in November before an excellent fourth of 18 runners at 100/1 at Warwick a fortnight later in a contest won by Willoughby Court which followed up at the Midlands track two weeks ago. “Militarian might go to Huntingdon on February 9 and I hope he might be good enough to take us to Cheltenham,” said Martin. The Stuart Edmunds-trained Cloonacool has yet to cut the mustard this season but ‘George’ as he is known at home, is likely to run in the next 10 days, either at Doncaster on Saturday or at Musselburgh the following weekend. It is part of a plan to try him left handed for the first time in more than a year to discover whether a long-term Aintree plan for the Red Rum Chase over 2m in April is feasible. Maria’s Benefit has been catching the eye on the Fences Farm gallops and has been entered for a mares’ bumper at Doncaster on Saturday. 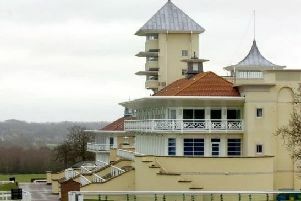 YOU somehow sense that the world of greyhound racing at Towcester is a slowly simmering pot which will boil spectacularly on July 1 when the tracks stages the Greyhound Derby for the first time. Currently staging regular weekly fixtures on a Tuesday evening as well as Saturday mornings along with its traditional Saturday night slot, this is the raised bar towards which Lord Hesketh, Kevin Ackerman and his team have been working tirelessly for the past five years; patiently, defiantly unblocking the obstacles in their path. You didn’t exactly have to be up with the lark to see the morning’s first race at 9.34am but at least there was time for a decent breakfast before Lord Hesketh’s own runner Ribble Ghost (he names many of his runners after his home family seat in Lancashire) had emerged from the fog to claim the third, at 10.06am for trainer Mark Wallis. Greyhound racing appeared to be in a parlous place before the Towcester initiative came along and injected a much-needed dose of energy and inspiration.